Happy Thanksgiving everyone! I love love love this time of year… time together with family, decorating for Christmas, watching “Elf” a million times – it is just the best. Now, don’t let the name of this recipe fool you, dump cakes are a brilliant invention where you essentially dump everything in the pan and bake. If you’ve never had a dump cake the name can be off-putting, but I promise you will love every bite. This cake is only slightly more complicated than a traditional dump cake in the fact you have to mix a few things to get the pumpkin base. It is, however, INCREDIBLE! The pumpkin with the yellow cake is scrumptious and the graham crackers, pecans and toffee create a buttery crunch on top! Serve it hot with some ice cream (I recommend cinnamon or buttered pecan flavors) and you will just melt. I serve this at all of my Thanksgivings I go to (and yes, there are many) and it is always the most popular dessert! I love pumpkin, but pumpkin pie is not my favorite. This Pumpkin Dump Cake is way better and a fun and easy twist on a traditional Thanksgiving dessert. I hope you enjoy this time together with your friends and family as much as I do, make the most of the holidays and the magic of Christmas time! Sometimes you just need a warm cookie and a cold glass of milk when it’s chilly outside… I know I do. Cookies were my first foray into baking, I was obsessed with trying all sorts of recipes. Needless to say, cookies are still one of my favorite things. I don’t get to bake them as much as I’d like to these days, but there are just days you need a good batch of cookies! I really love this recipe, it’s simple and quick plus the cookies taste amazing! What’s wonderful about these cookies is they almost taste better once they are cool and they stay soft for days (if you can even make them last that long)! Okay, so I know I talk a lot about all the different desserts I love… but I have to say, these are by far the BEST dessert I have EVER made. The dark chocolate cupcake is super moist and filled with delicious salted caramel that just makes me want to drool. I am literally in love with this cupcake! If you don’t believe me, try it. I promise you won’t regret the decision. I made these for a happy hour and people went nuts over them! I made them again for Halloween and I’m pretty sure I caught my husband eating 3 in one day (he refused to share the last one with me, too J). They are that good! I hope you enjoy them as much as I and my friends and family have, they are fabulous, decadent cupcakes! I have been feeling inspired by the Fall to try out some new Pumpkin recipes. This recipe is originally inspired by my favorite Pumpkin Dump Cake (don’t worry, I’ll be posting that before Thanksgiving). It brings out all my favorite flavors – pumpkin, cinnamon, pecan, nutmeg. It’s tons of yummy goodness! 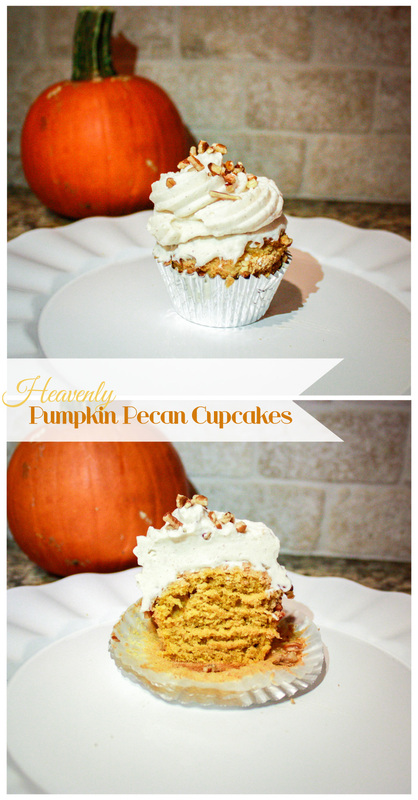 And what better to top off a pumpkin cupcake than a cinnamon cream cheese frosting! If you’re looking for something to ring in this beautiful Fall weather, this dessert should do the trick!